This is a time for reaching out and making connections, and for starting fresh in our relationships. 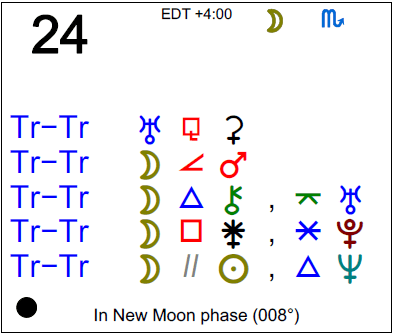 While we are proud of our ability to get along with others now, there can be some misunderstandings with Mercury nearing its station (it turns direct tomorrow). Tricky topics are best avoided or treated with extra care today and tomorrow. On this day after a Solar Eclipse, let the dust settle. 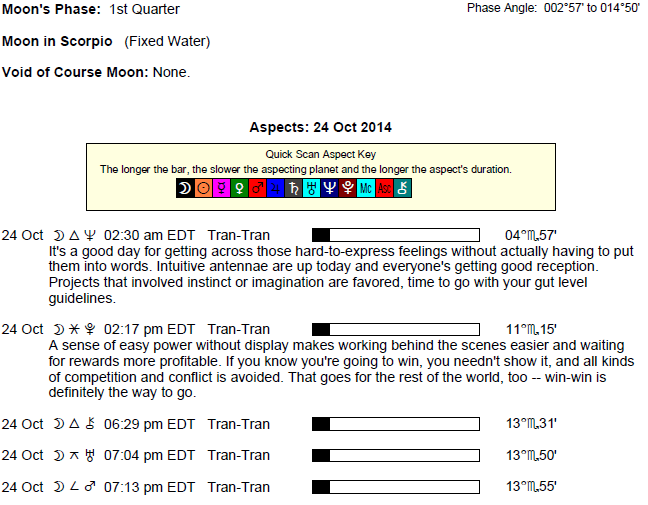 The Moon is in Scorpio all day. The Moon is waxing, and is in its New phase. Mercury is retrograde, in the sign of Libra (until tomorrow, October 25th). Review, reflect, and revise. Consider ways to improve negotiations skills, one-on-one communications. You have the ability to broach sensitive or taboo topics with special ease and tact today, and your appeal is both subtle and strong. Your intuition is powerful as well. While you may enjoy time to yourself, it can also be cleansing and rewarding to sort out problems with others. Energy with you today is generally warm and positive, but there is a hump to get over with Mercury coming to a station in its retrograde journey. It will turn direct tomorrow, but as it makes its shift, there can be misunderstandings and confusion. Be clear in your communications. When it comes to close partnerships and relationships, you can experience a real feeling of hopefulness about a matter today that you haven’t felt for some time. Today is very good for personal influence, and also for smoothing over relationships with others. It’s not about glossing over problem areas, but it’s not a time for raw emoting either. Today is better for showing you care with warm gestures. Keep things light and friendly. Even so, it’s important to keep in mind that we may not always be saying what we mean, or meaning what we say. Mercury is changing direction, and while many communication problems will clear up in the coming weeks, right now we are prone to misunderstanding one another. Strong energy for peace-making or simply for socializing is with you today, and this is especially the case on the job or while you pursue health or daily routines. You may be seeing the more pleasing aspects of these things, or someone is helping to make things seem a lot better. You can help this energy along by aiming to bring more harmony, beauty, or gracefulness to your work. You can consciously work on putting yourself into a better light with great results today. There may yet be the need to go over work and to watch what you say, however, with Mercury retrograde and nearing a station. Be as wise and patient as you can manage today. While there has been a lot of attention to the past recently, today the Sun is shining its light on hints of the future in terms of romance, creative affairs, and personal enjoyment. You are motivated to make improvements – to share yourself with others more spontaneously and heartfully. There is a strong focus on intense feelings and relationships today, possibly to the point of excess. This is a good time to really apply yourself to artistic pursuits. You are in a great position to gain positive attention. Today and tomorrow, however, it’s important to keep conversations light and clear. In many ways, today is a good time to speak about a matter close to your heart, but because Mercury is stationing (it will turn direct tomorrow), the potential for getting wires crossed is high. Try not to focus too much on the past, although some nostalgia can be fun and appropriate now. Channeling your energies into a project around the home that will truly make life easier can be especially good for you now. It is in fact a strong time for discovering information that was previously hidden to you, or for looking at something from an entirely different perspective. There can also be a wonderful feeling of hopefulness with you today, and family affairs can be the motivator. Even with possible disconnects today, your personal magnetism is very strong right now. There is a hopeful, happy outlook today, and this can be most obvious in your communications. You are attracting appreciation for your communication style or what you’re teaching and sharing. Cooperation comes rather easily now, although you still need to watch for misunderstandings with Mercury changing direction (it will end its retrograde tomorrow). While all-new projects started now may not take off later on, applying yourself to work and interests already under way can be very fruitful. There can be a lot of talk/thought about relationships, although you are coming at it from an analytic perspective. There may be a connection or reconnection made now that makes you feel good. You have a stronger than usual desire for comfort and coziness today. There may be a gift or bonus coming in, but there can also be a tendency towards extravagance and indulgence. It’s not the best day for buying a high-priced item, but it is good for expanding your thinking on business and financial lines. Turning your attention to things you already have can be fruitful as well. Your motivation is increasing. Today is very strong for personal appeal, but there is still a Mercury retrograde caution in effect – be clear to avoid misunderstandings, or patiently wait for a better time to express yourself, if something can wait. This is a time when you have more impact. There is great charm and appeal to your personal manner. There is a real demand for the qualities that you are naturally projecting. Motivation and hopefulness are increasing, and you can also get positive professional attention right now. Even so, there can be some misunderstandings today (Mercury is ending its retrograde tomorrow, and the shift can be problematic). You may be coming across as self-centered to some, even if you are not feeling that way. Your heart is open, you are in a more amorous mood than usual, and you’re inclined to a little self-pampering. Peaceful solutions can be found for problems that have previously presented themselves as challenges. There may be recognition or reward for past actions. There can be good feelings and happiness in your inner or private world today. Personal matters tend to trump more worldly affairs in your mind just for now. Today’s energies support seeing eye to eye with people on matters dear to your heart, although it continues to be important to be especially clear in your communications, or to save sensitive topics for a better time. There is a nice level of ease in social situations today, although there can be emotional or raw communications that may be misunderstood. While it’s important to be clear in what you communicate now, it’s also a time for spreading your wings, reaching out, and making contact. New connections are likely in the coming days. There is a stronger desire to please, particularly with friends and in group settings. Friendships can be enhanced and improved with warm gestures and expressions of appreciation. This is a strong day for being seen in a good light. You’re receiving more attention and admiration now, especially on a professional or public level. You may be appreciated for the responsibilities you fulfill or for your performance and ability to lead. You can rather easily put yourself into a favorable light, and business can benefit as a result. This is a time when beautifying, embellishing, and pleasing are all favored. There is much in the way of hopefulness when it comes to a partner or special friendship. While there can be a lot of good energy for cooperation today, it’s important to be especially sensitive and clear in your communications right now as Mercury “slows down” and changes direction. You can experience more passion about an idea, ideal, or course of study right now, and others are especially interested in how you feel and what you have to say. Personal magnetism is good, and you’re feeling a nice glimmer of hopefulness about a matter that you’ve not felt strong about for some time. Be especially sensitive to how you’re expressing yourself, pay more attention to directions, and watch also how others are receiving your words. Today and tomorrow offer us warm, cooperative energy, but also complications in the areas of communications and transportation. If Your Birthday is October 24th, the year ahead is about starting fresh, reinventing yourself, and starting a new chapter in your life story. If Today is Your Birthday full horoscope here. There can be tension between our desire to go our own way and the need to take care of the people in our lives or our domestic and personal responsibilities. You speak from your heart, and are a compassionate and caring person with a strong intuitional nature. You value your personal relationships, in which you often taking on a caretaker role. You are such a sympathetic and understanding person that you are often caught in the role of mother to your loved ones. Your weakness lies in the fact that you fail to take an objective perspective when necessary. You often react without thinking things through first. You have emotional power and can mould your life in the manner you choose. You are insightful, creative and intuitive. You have artistic talents. You attract people with your warm and sympathetic nature. You have a tendency to thrust your own original thoughts and ideas onto other people. You wilfully defend your right to have different views and can fail to appreciate other people’s points of view. You need to learn to respect all forms of communication and thinking. You can be cruel in your speech. You suffer from obsessive thoughts and find it difficult to think positively and calmly. You are focused on your own thoughts and opinions and may not listen to others. You are being urged to develop your communication skills. Your destiny in this life may be linked to some form of teaching or communication. This may also be linked with groups. You have the opportunity to blend your charm and assertion. You can be both gentle and strong. 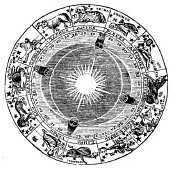 Sun 02° Taurus 37' 51"
Moon 18° Sagittarius 40' 06"
Mercury 07° Aries 40' 38"
Venus 02° Aries 53' 58"
Mars 15° Gemini 00' 34"
Neptune 17° Pisces 48' 19"